Have you used a bike tool before that hasn't delivered when you needed it the most - stuck on a road or trail far from home?! Buy the Pro Bike Tool 8 in 1 for PRO PERFORMANCE when it counts - the BEST Bike Tool out in the market from the Bike Tool Experts. Great for tightening and adjusting bicycle handlebars, stem, seatpost, chainring bolt, derailleurs and more! WORRY FREE SHOPPING with the Pro Bike Tool 'Promise'. We know our products are the Best Quality and they'll last a Lifetime, so if you have any product issues - we're very happy to either provide a refund or a replacement! 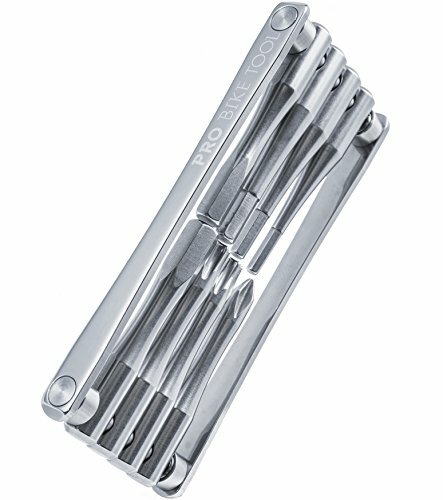 RELIABLE & BUILT TO LAST multi tool - Cold forged SUS420 stainless steel for high strength and durability. SLIM, COMPACT AND LIGHTWEIGHT bicycle tool kit. Only 0.3 inches thick, 3.7 inches long & lightweight at 3.49oz. SAFELY TIGHTEN BOLTS, EVEN THE TOUGHEST ONES! 8 long leverage tools: Allen / Hex Tool 2.5/3/4/5/6, Star Shaped/Hex Tool T25/T30 and Phillips Tool PH1 cross drive. Auto indexing feature ensures tools lock into place when tightening. SLIM, STYLISH & DISCREET BAG included to safely protect the bike tool. Check out our 'Buying Guide' video in the 'Related Video Shorts' section.